I was sitting near someone last Friday and heard them getting very heated about ‘those people’ that say ‘The Highlands’ instead of ‘Highlands”. And then there was a sign that said “The” and person who put it there should be shot. – So then I had to go find a picture of the sign. I found it somewhat humorous. Really, everything else that’s wrong in town and *that’s* what you’re really mad about? I guess because I’m a benny and only have lived here 11 years, I kind of say both. But I wanted to see what others thought about this debate..
People whose families have been here forever actually say HighLANDS. And why is everybody getting upset NOW? Isn’t this the sign on the bus stop across from OLPH? Hasn’t it been like this for years or did they just change it? I don’t think this is a “just now”, I think its an ongoing debate/irritation. The town is smashed from Sandy, and this is the big debate! The only reason I think we should consider changing the name is so more people can’t find it! May I suggest “Crabwell Corners,” “Stankwell Falls” or “Bug Tussle!” We might as well do it now as long as we’re doing all this other remodeling! I didn’t know Atlantic Highlands was that bad. 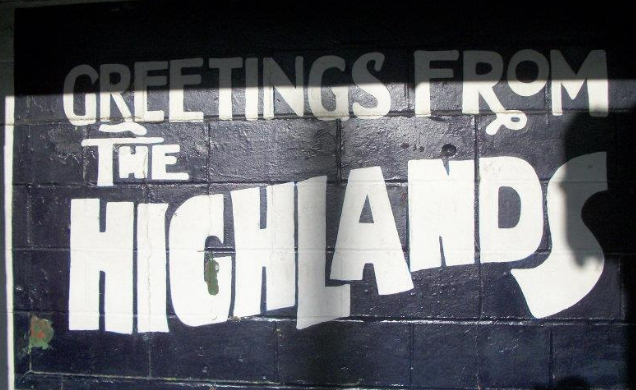 I have been in town for 16 years now… it has always been known as Highlands to me. You’ve only been here for 16 years? Do you still get the “Slaughtered Lamb” look every time you walk into a place in Highlands? Not as much anymore but I remember first time at the navigator I got that look. And how long has that bar been gone? about 15 or 16 years now.